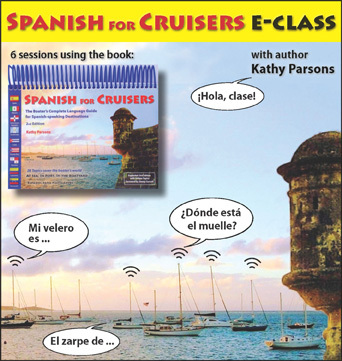 Kathy Parsons, author of SPANISH FOR CRUISERS and FRENCH FOR CRUISERS, regularly speaks at boat shows and other gatherings of boaters. Spanish is the most common language (after English) that you will encounter cruising. A basic ability to communicate in Spanish along with an ability to recognize and speak cruiser-related vocabulary and phrases will make your time in Spanish-speaking countries easier and much more rewarding. This webinar is designed for the person with little or no Spanish who wants to be able to communicate in Spanish in the typical experiences a cruiser encounters. You will be learning in the most efficient way possible: Every lesson is built around cruising scenarios. You will learn to recognize and respond with the exact words and phrases you will be using to clear in and out of port, make radio calls, communicate with marinas, boatyards and repairmen, provision in local markets, etc. There will be handouts and between class assignments to help you develop the skills covered in the class. You will develop custom dialogues for describing your boat and crew, personalized crew lists, and practice listening to boating-related audios by native Spanish-speakers..
You will get personal feedback on your assignments so that you can feel confident that you are communicating what you mean to communicate. We are also going to have a lot of fun in this class, because it's the best way to learn. Kathy Parsons has often told cruisers: "Get over thinking that you are going to fool the locals into thinking that you are a native speaker. Instead, consider it your mission to amuse the locals with your attempt to speak their language." “Thank you so much for the wonderful classes. You've given us such a great start on learning Spanish and we are determined to continue working with all the super helpful materials you've provided. That last class was amazing - it's like a light bulb came on when you showed us how to put the verbs together with the mini-conjugations we had already learned and open up a whole world of being able to communicate in sentence form!”.
" You are a terrific teacher and we look forward to seeing you share your vast knowledge in future SSU classes. I can hardly wait until we have some experience under our belts too! ." Provisioning, trivial ashore, becomes a key skill for successful cruising. We will discuss provisioning from start to finish, beginning with factors that affect what you will (and won't) want to take: where you plan to cruise, how you cruise, your eating and entertaining style, your boat, storage space and equipment (e.g. refrigeration and freezer space or lack of). You'll learn how to avoid LOB (lost on board) with strategies and systems for organizing, stowing, and inventorying (manual, computerized, and app-based). Find out how to preserve what you have aboard (vacuum sealing, drying, storage containers and systems). Kathy will discuss reprovisioning in foreign countries: making use of local products, major reprovisioning areas and what you can get where. There will be lots of useful handouts and downloads to help you get started including provisioning lists of food, supplies and spares, multilingual reprovisioning lists, etc. The French and Spanish-speaking countries of the Caribbean provide rich and varied cruising opportunities. Yet boaters hesitate, faced with language and cultural differences. With photos, hand-outs, and personal stories, author and cruiser Kathy Parsons shows why and how to fully explore these areas. Sometimes it is the little things that make all the difference. With decades of cruising and tens of thousands of miles under their keels, cruisers Pam Wall and Kathy Parsons have learned lots of little things that make cruising safer, more comfortable, more successful. In this quick-paced seminar, they will share some of their favorite tips, techniques and gear. They will cover the full gamut of cruising: from passage-making, boat-handling, anchoring, line-handling, provisioning, stowage and boat systems, safety, communications, finances. You are bound to learn new ideas to improve your cruising. How do you plan for the popular route through the Bahamas to the Caribbean? We will take you from your jumping-off point in Florida, through the Bahamas and its many delightful anchorages, on through the Turks and Caicos, the Dominican Republic, Puerto Rico, the US and British Virgins, and the Eastern Caribbean. We will discuss practicalities: charts and cruising guides, availability of provisions, parts, fuel and water, timing, weather and planning ahead for hurricane season. Kathy Parsons will share some of her favorite “don't miss” anchorages as well as strategies for making the most of that first season in the Caribbean. To make the most of your cruise to Mexico, you'll want to be able to communicate with the people you meet—from port officials to repairmen, market vendors and fishermen. In this seminar Kathy Parsons will give you techniques and strategies that help you communicate with everyone you meet ashore and on the water. Cruisers are becoming more and more interested in traveling the French canals and rivers. The 5000 miles of French waterways offer us the ability to shop in rural markets, cruise through areas designated as World Heritage sites, tie up in ancient villages and cities, along fields and vineyards, and even in the center of Paris. Through photos, hand-outs and personal stories, Kathy Parsons provides an introduction to the French canals, the options for cruisers wishing to explore them, and a host of practical information. Kathy Parsons has spoken at Strictly Sail Chicago, Strictly Sail Pacific, Strictly Sail St. Petersburg, Strictly Sail Miami, the US Sailboat Show in Annapolis, the Seven Seas Cruising Association Gatherings in Annapolis and in Melbourne (Florida), Borders Books, West Marine and Downwind Marine. She also gives SPANISH FOR CRUISERS classes to boaters in ports where they congregate. 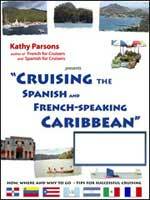 In 2004, she worked with Alliance Française of Grenada to develop a FRENCH FOR CRUISERS class for visiting boaters.